Contact & Get to Know Me! 3 Comments on I Made Tea…Now What? You finished making the perfect cup of tea. You have made multiple cups…now what? Either you can throw away your perfectly good used leaves or find something else to do with them! I personally like option two. I often find myself buying expensive tea, and feeling bad when I am done brewing. So I took it upon myself to find five ways you can reuse your old tea bags! This is the basic recipe, the best part is you can, in turn, customize it. For example, you can add lavender essential oils and lavender flowers to the scrub. Or you can make the recipe a Chamomile Black Tea Salt Scrub by using 2 chamomile pouches/parts and 2 black tea pouches/parts instead of 4 black tea pouches. You also can easily substitute the salt for sugar. You can also use any kind of tea you wish: herbal, white, green, black. The choice is yours! Each tea has its own health benefits as you can read in my earlier article The Tea about Drinking Tea. This makes a wonderful spa treat for yourself and you did not have to waste any leaves to make this! 2) Take a Tea Bath! Again this is a very basic recipe and you can customize it a lot for your own wants and preferences. Switch out oils or salts for different kinds or even add essential oils. Another ingredient you can add is rose petals or lavender flowers. And again there are different health benefits to whatever tea you use so do not be afraid to switch it up and try different kinds! Next time you soak, try this marvelous concoction! Putting cooled black tea pouches under your eyes can reduce dark circles and swelling. Pretty cool right? So if you have just brewed some nice tea, you can pop those beauties in the fridge or freezer if you are running short on time (make sure they do not freeze but are chilled) and then put them under your eyes! 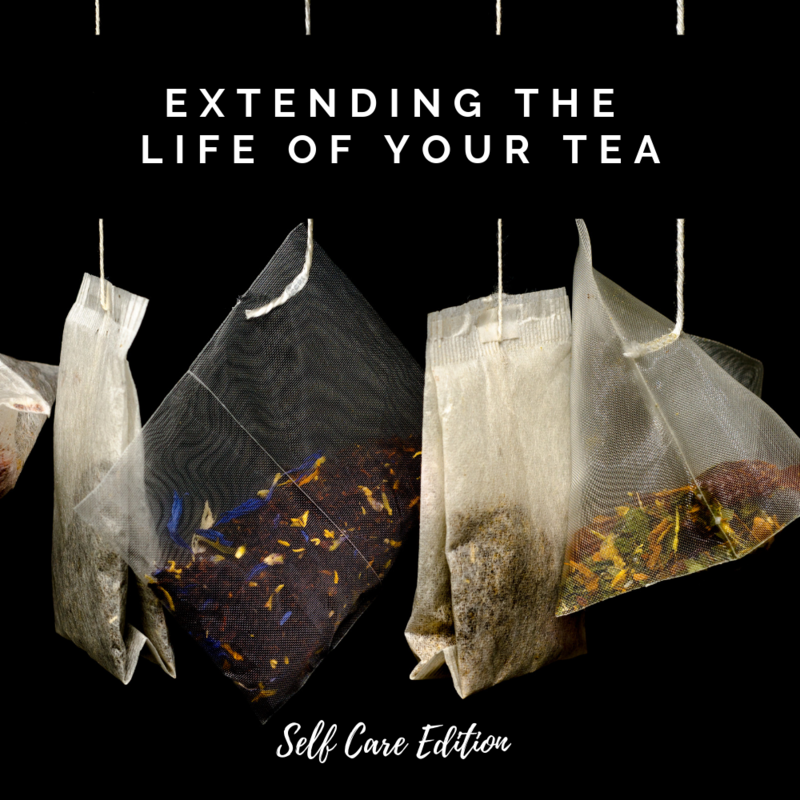 It is the same idea as using cold spoons, but with the added punch of the benefits of the black tea as well (helps with skin aging, tone, and acne). If you would like stronger results, of course, you can use new tea bags or even make it half new and half old. But this could be a fun treat for your hair and yourself! 5) Black Tea Face Mask! Mix these ingredients together and then apply to face. Leave the mixture on for five minutes, then gently start washing the mask away with water, massaging and exfoliating your skin as you do so. The antibacterial properties in the honey and lemon and the caffeine from the black tea will make your skin say thank you! And that is five ways to reuse your old tea bags – spa edition! I hope you learned something and found perhaps something new to try! Happy Brewing! I Took a Tea Bath…. Subscribe & Get Instant Access! Check your inbox for direct access to Tea and Me!